Sydenham House | Launceston Then! 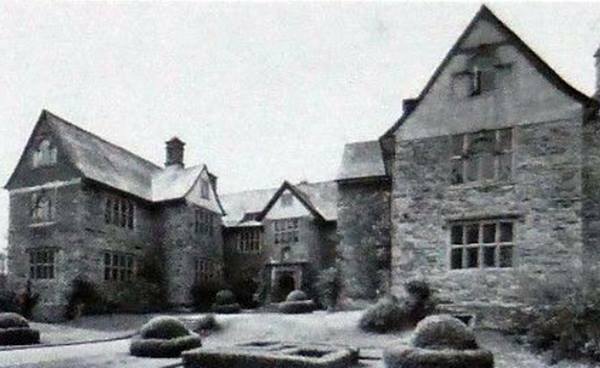 According to the Domesday Book of 1086, immediately before the Norman Conquest of 1066 the manor of SIDREHA~was held by the Saxon magnate Brictric, a great landholder in Devon and more widely in England. Following the Norman Conquest, it was one of the 107 Devonshire landholdings of Juhel de Totnes (died 1123/30), the first Anglo-Norman feudal baron of Totnes and feudal baron of Barnstaple, both in Devon. Juhel’s tenant was a certain William. On his banishment by King William Rufus, Juhel’s property was confiscated, and Sydenham later became the seat of the de Sydenham family, which as was usual took its name from its seat, whose overlords were the subsequent feudal barons of Totnes. In the 13th century Book of Fees Maurice de Sideham is listed as holding lands in Parva Sideham (“Little Sydenham”) (which adjective was used to distinguish it from Sydenham Damerel, also in Lifton Hundred) from Reginald de Vautortes, feudal baron of Totnes, and is recorded by Pole (d.1635) as holding North Sidenham, this manor, in 1242. The de Sydenham family was succeeded by that of de Mauris, from which it passed by marriage to Trevage. It was then passed to the Wyse family. ‘The present house was built by Sir Thomas Wyse during the reign of Henry iv and was extensively re-built in the 17 century: ‘beautified with buildings of such height as the very foundation is ready to reel under the burthen’ was a further description of the day. Fortunately the foundations are in the solid rock and so the mansion exists very much as Sir Thomas left it. He died at Sydenham before 14th April, 1630. His son Thomas did not live at Sydenham, but at ‘Keame’ (Keyham), or ‘Wyseworthie’, where Sir Thomas had “built a proper house for his pleasure, called after the founder’s name Mount Wise”. This house had been settled on Lady Mary Chichester (20 Aug, 1629) on her marriage to (22 October) Thomas Wyse. He was one of the two county members, and died 1641, when his son and heir, Edward, was only nine years old. His wardship was obtained, as his father “earnestly did beseech and entreat” by Francis Buller, of Shillingham, who seems to have managed the estates carefully. Buller resided sometimes at Sydenham, and kept stores there in 1642, when Sir Samuel Rolle writes to Sir R. Buller (22 Sep. 1642), “I have sent to Sidnam for 20 Musketts, of which I desire you to acquaint my Cousin Buller”. The Wyses were Parliament men, but Edward took no active part in the Civil War. After finishing his education at Exeter College, Oxford, he married (2nd. Mar. 1651-2), at the age of nineteen, Arabella, daughter and co-heiress of Oliver Lord St. John, of Bletsoe, slain at Edgehill fighting for the Parliament. Edward Wyse resided with his wife’s family at Melchbourn, Bedfordshire, where his two children, St. John (b. 14th. January, 1652-3 – died 19th. April, 1658) and Arabella (b. 12th. January, 1653-4), were born. In 1653 he returned to Sydenham, and either because the house had been injured during the war, or because he found it too small, he commenced to build. The local tradition of a siege of Sydenham is not, so far as I have been able to discover, supported by any contemporary evidence, though the swords and pistols of the period found in the Turtle Grove, near the house, may surely be taken as evidence of fighting of some sort. It is at all events certain that Edward Wyse carried out extensive building operations, for the estimates in his own handwriting exist. They are dated February, 1654, and set forth first “Mr Batleys vallew for ye building of my house at Sidenham”, etc., and then, “A guesse given by me what ye materialls will cost with all carriage,” etc. It is evident that a new building is meant not merely a restoration of the existing mansion, as cellars and foundations are to be dug. As wood windows are particularly mentioned, the square block at the back, looking on the garden, must have been Edward Wyse’s addition; the windows here are the only wooden sashed ones in the house, all the rest having stone mullions. He made some alterations in the interior of the house, the fireplace in the great hall bearing the date 1656, and his arms and those of his wife. The sole heiress Arabella Wise, married Edmund Tremayne (1649-1698) Prior to this marriage Tremayne was seated at Collacombe, in Lamerton, for several generations. They had this by marriage with the Trenchards. 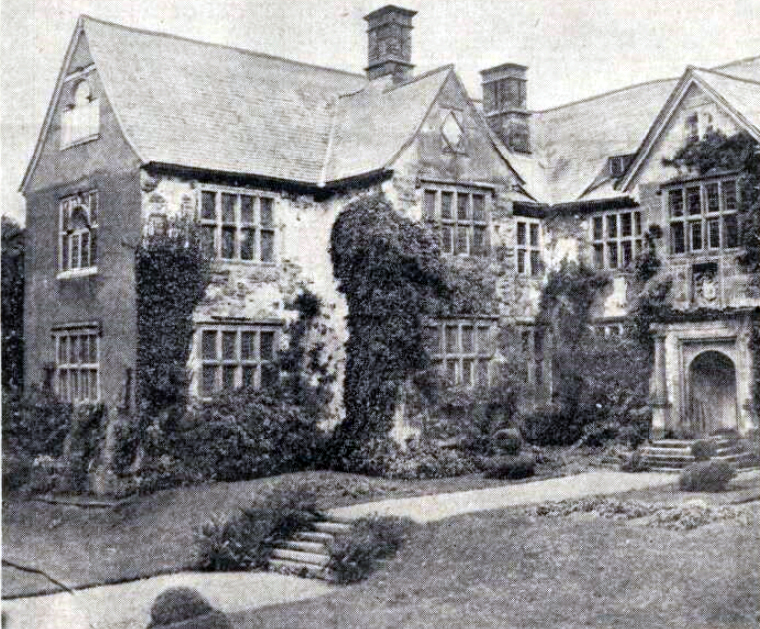 The Cornish Tremaynes used Sydenham as a shooting box and dower house, and it remained unaltered until 1937, when, following the death of Miss Tremayne, the house and contents were sold. Sydenham was purchased by Major James Despencer-Robertson who commissioned Philip Tilden to make repairs to the house. A girls school began in 1940 during the Second World War, part of the Glendower School, London, and continued as a boarding and day school until its closure in July 1966. It was put up for sale in 1977. In 1992 the 1,200 acre estate was purchased by Graham Hart who immediately set about restoring the house and returning the estate to shooting. However, all the hard work was nearly destroyed one night in November 2012 when fire broke out. It took fifteen fire crews to put the blaze out with the nearby lake being used as a source of water. A large part of the roof, top storey and second floor, including the panelled Long Gallery were destroyed. The house is currently undergoing a full restoration to the damaged area.